Letters from Utopia is a documentary photographic research that studies groups who wish to extend the human life span extremely or even aim to become immortal. For this project Daan Paans visited five different movements and their key players who have a shot at an utopian world order. The stories range from an occult belief of the past to a scientific outlook for the future. Since time humans have been fascinated by the idea of an infinite life, with the ultimate goal of overcoming (one’s own) mortality. First, a distinction should be made between the immortality of the soul and the immortality of the body. Leaving all forms of religious pre-occupations with the ‘afterlife’ aside, a fascinating domain remains within which the extension of life is thought about and experimented with in diverse manners. This is where the fascination of Daan Paans begins. 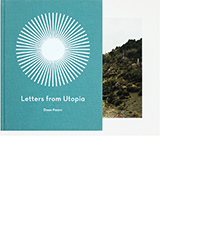 For Letters from Utopia, Paans has entered a world of individuals and organisations that are each in different ways obsessed with their desire to extend life, if not immortality. Driven by his inquisitive mind, his limitless sense of wonder and boundless curiosity, Paans visited five divergent movements and their protagonists who take a shot at an utopian world order. He came into contact with the remnants of the Cross-Correspondences (contact with those living in an ‘afterlife’), the Aumists (a polytheistic community with a once supposedly immortal leader), FM-2030 (a transhumanist movement, wherein the laws of human existence bound by nature are stretched or even surpassed), the Cryonicists (whose members are frozen after their death in the hope of later being revived) and the Life Extension Institute (a physiological prevention of the ageing process). As a leitmotiv Paans has been lead by the question that he and those he portrayed ceaselessly pose: long live immortality?! Daan Paans (1985) is a documentary photographer who, with his photography, aims to depict the ineffable and invisible. Because he is drawn to matters that, due to their intangible nature or abstraction, don’t lend themselves well to depiction, he looks in particular for a form of (visual) evocation; a visual language that refers indirectly to the subject in question, thereby committing the viewer and giving them responsibility. Jos de Mul (1956) is professor of philosophy of man and culture at the Erasmus University Rotterdam. From his hand appeared, besides other, Cyberspace Odyssey (4th edition, 2005). His works have been awarded with the Erasmus Prize (1993) and the Socrates Trophy (2002). As philosopher De Mul is particularly interested in issues such as the impact of information and communication technology on humans, the rise of visual culture and contemporary art. For Letters from Utopia De Mul wrote an essay, which is an adaptation of parts of the prologue and first chapter of his book Destiny Domesticated. The Rebirth of Tragedy Out of the Spirit of Technology, which appears in the fall 2013.